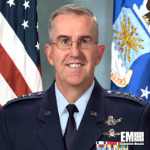 Air Force Gen. John Hyten, commander of the U.S. Strategic Command, has said at a Senate Armed Services Committee hearing that Stratcom is “fully ready” to help protect U.S. and its allies from security threats and deter adversarial attacks, DoD News reported Tuesday. He told committee members Tuesday that Stratcom functions as a global warfighting command to ensure the readiness, safety and realiability of the country’s strategic capabilities. “Deterrence in the 21st century requires the integration of all our capabilities, across all domains, enabling us to respond to adversary aggression any time, anywhere,” added Hyten, a 2018 Wash100 recipient. He pointed to nuclear triad as the backbone of national security and deterrence efforts. The triad encompasses B-21 bomber aircraft, Columbia-class ballistic missile submarine, nuclear command-and-control, long-range standoff cruise missile, nuclear warhead and ground-based strategic deterrent programs.